The shaping of boards is fundamental to woodworking. In the SketchList 3D cabinet design software package the term shaping really means cutting in some way. You might cut a toe kick the bottom of a kitchen cabinet side, you might cut a curve in the front of the desktop, or you might cut a 45° angle to achieve a mitered joint between two pieces. In the SketchList 3D cabinet design software boards have edges and surfaces. This is part of what you specify when you create a new board and pick one of the three possible orientations. Edges can receive joinery and contours, surfaces can be shaped. 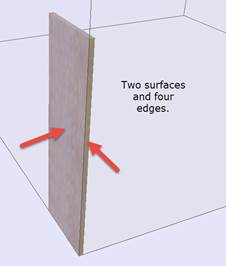 Both edges and surfaces can receive round and non-round holes. A non-round hole on the surface can be thought of as a dado or a slot. First step in shaping a board is to select the board in the board level details. This can be done by selecting the board and double left mouse clicking it or clicking the details button on the right side of the SketchList 3D cabinet design software main form. This will bring you into the SketchList board shaping tool. The shaping tool contains an image of the board. That image includes the board being shaped and the surrounding boards to help provide a context for your shaping efforts. In addition to the image there is a toolkit with buttons that perform different types of shaping operations. The third element of this shaping tool is a section on the lower left-hand side that allows you to set grid size, turn snap to on and off, and to see – enter – correct the value the points determining the shapes. Essentially shaping is a matter of working with points on the board. Board that has not yet been shape will have four points one in each corner. There are three types of actions dealing with points. Taking an existing line and inserting a point cuts that line into two segments. Deleting a point will automatically create a line to the two points adjacent to that point. Moving a point changes the location of the endpoint of the line or lines affected. You want to create a toe kick corner of a board you would insert one point on the bottom say three units from the front. You would insert another point on the front edge of the board say three units from the bottom. Then you would select the corner point (that who’s front and bottom values are both zero) and change those values to both be equal to three. The effect of this is to show a toe kick cut from that board. 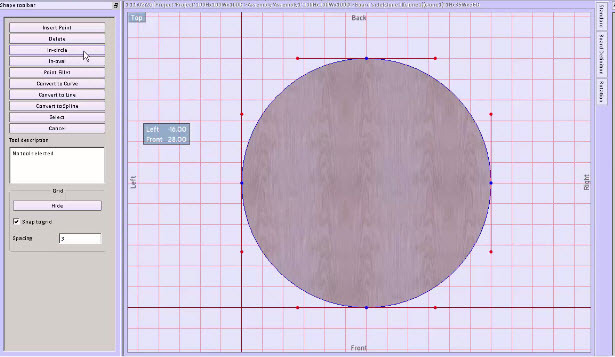 You want to create a circle of a board – say for a tabletop – select the board surface and click on the circle tool in the toolbox. That board will become circular. If you think about it a bit you can take a circular board and by deleting different points on the circle turn that circular board into a semi-circle or any other shape that you might desire. You want to create a curved edge of a board select that edge and pick the curve tool in the toolbox. Two red dots appear on the line. Drag one or both of those red dots to achieve the curve you desire. Fourth example of a shape t— cutting an angle at 45° to achieve a 90° mitered corner. This is really simple. Select a point and drag that point away from the corner the number of units equal to the width of the board. 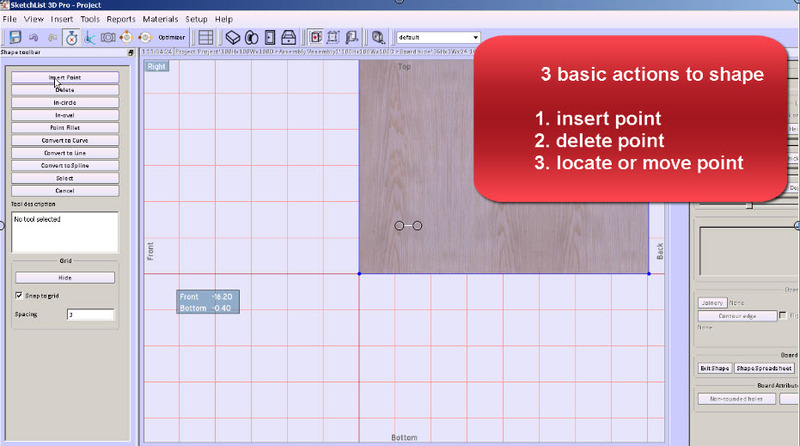 For example you have a 3 unit wide board you want to put a 45° cut on that board take one of the endpoints of the board. Then change its value by three units. You can either add or subtract the three units depending which way you want the miter to go. The shaping tool in the SketchList 3D cabinet design software is very powerful and flexible. Over time you will move beyond these basic examples of shapes to create the types of complexity required by your projects.